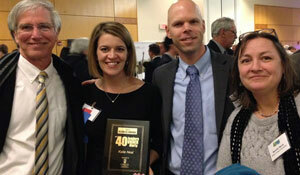 CER staff members Kevin Cox, Katie Neal, Brett Eaton and Bonnie Davis attended the Feb. 19 awards ceremony. The Triad Business Journal has named Katie Neal (’03), executive director of news and communications, to its annual list of “40 Leaders Under Forty.” She was recognized at a ceremony in Greensboro on Feb. 19. The awards honor 40 remarkable individuals, all under the age of 40, who have distinguished themselves in their careers as well as in their communities. Neal was recognized for overseeing media relations for Dr. Maya Angelou’s memorial service in Wait Chapel; spearheading the University’s strategy and response to widespread media attention when journalist Jill Abramson was fired by The New York Times only five days before commencement ceremony; and leading efforts within the Junior League of Winston-Salem to enhance the membership experience. Neal’s complete “40 Under Forty” profile can be viewed online or in a special publication in the Feb. 20 edition of Triad Business Journal. Read more about the 2015 winners. In September 2014, the Winston-Salem Chamber Commerce named Neal to its inaugural class of “Winston Under 40” Leadership Award winners. Neal returned to her alma mater as national news strategist in June 2011. She became executive director of news and communications in October 2012.